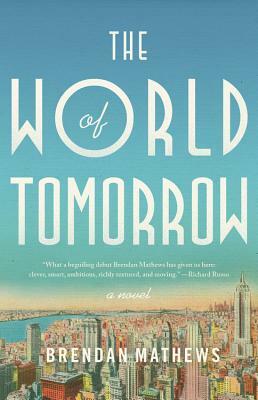 The World of Tomorrow (Hardcover) | Copperfield’s Books Inc.
Brendan Mathews, a Fulbright Scholar to Ireland, has published stories in Glimmer Train, the Virginia Quarterly, and the Cincinnati Review, among other publications, and his fiction has twice appeared in The Best American Short Stories. He lives with his wife and their four children in Lenox, Massachusetts, and teaches at Bard College at Simon's Rock. "Mathews has a big, rambunctious talent . . .
stylist, and breathing life into so many diverse characters is no mean feat . .
the run from Irish gangsters, fascist regimes, and crazy relatives . . .
mansion; the savory delicacies from a pushcart on a crowded Bowery street . . .
Mathews takes exquisite care in creating even marginal characters and locales . "What a beguiling debut Brendan Mathews has given us in The World of Tomorrow: clever, smart, ambitious, richly textured, and moving." "Brash, bold, completely entertaining, and dazzling in its evocation of time and place, Brendan Mathews's splendid debut offers pleasures on every page." "Masterful....This novel is a remarkably fast and exhilarating read, reminiscent of Michael Chabon's The Amazing Adventures of Kavalier & Clay....With the wit of a '30s screwball comedy and the depth of a thoroughly researched historical novel, this one grabs the reader from the beginning to its suspenseful climax." "Mathews's first novel is all you could want in a piece of popular fiction. The tension never lets up, and the story is fast and mind-spinningly complicated....There's suspense, humor, love, of both the doomed and requited varieties....This novel should prove irresistible to anyone wanting a diverting read. It's quality stuff--and fun."